This article is about the suburb. For other uses, see Fitzroy (disambiguation). Fitzroy was Melbourne's first suburb, created in 1839 when the area between Melbourne and Alexandra Parade (originally named Newtown) was subdivided into vacant lots and offered for sale. Newtown was later renamed Collingwood, and the area now called Fitzroy (west of Smith Street) was made a ward of the Melbourne City Council. On 9 September 1858, Fitzroy became a municipality in its own right, separate from the City of Melbourne. In accordance with the Municipal Act, on 28 September 1858, a meeting of ratepayers was held in 'Mr Templeton's schoolroom, George street' to prepare for a local council election, with Dr Thomas Embling, MLA for Collingwood, presiding. The council election took place two days later and the first councilors were; Thomas Rae, George Symons, Edward Langton, Henry Groom, Benjamin Bell, Edwin Bennett and Thomas Hargreave. The first council meeting, held after the declaration of election, was at the Exchange Hotel, George Street, and Symons was unanimously elected chair. Surrounded as it was by a large number of factories and industrial sites in the adjoining suburbs, Fitzroy was ideally suited to working men's housing, and from the 1860s to the 1880s, Fitzroy's working class population rose dramatically. The area's former mansions became boarding houses and slums, and the heightened poverty of the area prompted the establishment of several charitable, religious and philanthropic organisations in the area over the next few decades. A notable local entrepreneur was Macpherson Robertson, whose confectionery factories engulfed several blocks and stand as heritage landmarks today. The Fitzroy Gasworks was erected on Reilly Street (now Alexander Parade) in 1861, dominating the suburb, with the Gasometer Hotel located opposite. The establishment of the Housing Commission of Victoria in 1938 saw swathes of new residences being constructed in Melbourne's outer suburbs. With many of Fitzroy's residents moving to the new accommodation, their places were taken by post-war immigrants, mostly from Italy and Greece and the influx of Italian and Irish immigrants saw a marked shift towards Catholicism from Fitzroy's traditional Methodist and Presbyterian roots. The Housing Commission would build two public housing estates in Fitzroy in the 1960s; one in Hanover Street and one at the southern end of Brunswick Street. Before World War I, Fitzroy was a working-class neighbourhood, with a concentration of political radicals already living there. Postwar immigration into the suburb resulted in the area becoming socially diverse. Many working-class Chinese immigrants settled in Fitzroy due to its proximity to Chinatown. There is also a noticeable Vietnamese community, a small enclave of Africans, and the area (particularly Johnston Street) also serves as a centre of Melbourne's Hispanic community, with many Spanish and Latin American-themed restaurants, clubs, bars and some stores. Like other inner-city suburbs of Melbourne, Fitzroy underwent a process of gentrification during the 1980s and 1990s. The area's manufacturing and warehouse sites were converted into apartments, and the corresponding rising rents in Fitzroy saw many of the area's residents move to Northcote and Brunswick. In June 1994, the City of Yarra was created,[by whom?] by combining the Cities of Fitzroy, Collingwood and Richmond. Fitzroy's topography is flat. It is laid out in grid plan and is characterised by a fairly tightly spaced rectangular grid of medium-sized streets, with many of its narrow streets and back lanes facilitating only one-way traffic. Its built form is a legacy of its early history when a mixture of land uses was allowed to develop close to each other, producing a great diversity of types and scales of building. 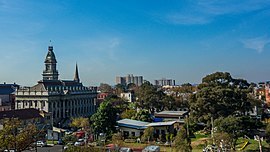 In the 2016 Australian Census conducted by the Australian Bureau of Statistics, Fitzroy had a population of 10,445. The median age (33) was younger than the national average (38), while the median weekly individual income (AU$925 per week) was higher than the national average (AU$662). Only 24.9% of Fitzroy's population are married, compared to 48.1% nationwide. 53.3% of people were born in Australia. The most common countries of birth were England 3.9%, Vietnam 3.3%, New Zealand 2.9%, China 2.7% and United States of America 1.2%. 61.0% of people only spoke English at home. Other languages spoken at home included Vietnamese 4.1%, Mandarin 2.5%, Cantonese 2.1%, Arabic 2.0% and Greek 1.6%. The most common response for religion was No Religion at 48.2%. Fitzroy's housing is diverse. It has some of Melbourne's earliest surviving houses and one of Melbourne's most extensive stands of terraced housing, along with a mix of converted industrial and commercial buildings, walk-up flats, modern apartments and public housing. Among the earliest homes are Royal Terrace (1853–1858) on Nicholson Street. Overlooking the Carlton Gardens, Royal Terrace was one of the first of its kind in Melbourne. Fitzroy's "character housing" (pre-war) is now mostly gentrified and highly sought after real estate. As early as 1923, the City of Fitzroy was accused of 'creating slums' by allowing inappropriate development such as three houses on a 31-foot by 100-foot block. By 1953, the state Housing Minister Thomas Hayes, said that Camp Pell in Royal Park, Parkville, Victoria, which had been a temporary military camp for United States forces during the Second World War, 'might become a permanent emergency housing settlement' and 'Fitzroy slum dwellers who had refused offers of alternative accommodation by the housing Commission because they would have to pay higher rents would probably' be moved there. Two years later the headline was 'Outcry Rages Over Fitzroy Slums', as the state government accused the Commonwealth of bringing in immigrants that the states had nowhere to house, arguing that the 'Awful, dilapidated buildings in Fitzroy, crowded beyond description with exploited New Australians were a grave danger to the heath of the community.' The Atherton Gardens high-rise public housing estate, on the corner of Brunswick and Gertrude Streets, is one of Melbourne's largest, built by the Housing Commission of Victoria as part of its controversial "slum clearance" urban renewal program in the 1960s. The Commission was established by the Housing Act 1937 in response to slum housing in Melbourne, and operated under the Slum Reclamation and Housing Act 1938. Due to its desirability as a place to live, Fitzroy faces increasing pressure for residential development. Recent residential projects in Fitzroy have sought to express a sense of Fitzroy's urban character in various ways and have been hotly contested in some cases. Fitzroy's traditional representation at all levels of government reflects the area's working class and bohemianism, Left-wing politics dominates. The Australian Labor Party and more recently the Australian Greens both have a very strong political presence. At a local level, Fitzroy is part of the City of Yarra Local Government Area. The Fitzroy area falls within the wards of Langridge and Nicholls, both of these wards are currently represented by the Australian Greens. At a state level, Fitzroy is within the Electoral district of Richmond, traditionally a safe Australian Labor Party seat. 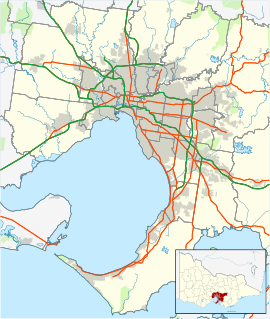 At federal level, it is within the Division of Melbourne, which was taken from Labor by the Australian Greens in 2010. The area formerly had its own municipal status from 1858, with the City of Fitzroy meeting at Fitzroy Town Hall on Napier Street. The Town Hall is on the Victorian Heritage Register for its state historical and architectural significance. The building was constructed in stages (1863, 1887 and 1890) to comprise municipal offices, meeting hall, police station, courthouse and clock tower. Since the amalgamation of the City of Fitzroy with the City of Collingwood and the City of Richmond in 1994 to form the City of Yarra, the Town Hall has functioned as secondary offices for the City of Yarra, and other occupants including the Fitzroy Legal Service, currently at Level 4, Moor Street entrance. There are many small commercial art galleries, artist-run spaces and artist studios located within the suburb. 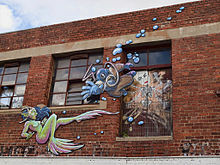 Fitzroy has a thriving street art community and is also the home of Gertrude Contemporary Art Spaces and the Centre for Contemporary Photography. Fitzroy is a hub for live music in Melbourne, and plays host to several prominent venues; The Old Bar, Bar Open, the Evelyn Hotel, Gertrudes Brown Couch, and Cape Live. The well-known Punters Club was also located in the area; however, it was forced to close in 2002. During the late 1970s, Fitzroy was home to the little bands scene (also known as the "North Fitzroy Beat"), which gave rise to experimental punk acts the Primitive Calculators and Ollie Olsen's Whirlywirld, rock group Hunters & Collectors and Lisa Gerrard, of Dead Can Dance. The Moran and Cato warehouse designed by R.A. Lawson is considered to be of high architectural merit. The Champion Hotel is notable for its fanciful Edwardian design. Fitzroy has a large number of pubs for such a small suburb. 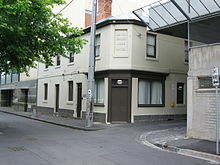 The former Devonshire Arms hotel was located in Fitzroy Street and remains the oldest building in Fitzroy. There are many other pubs in Fitzroy. The tiny suburb of Fitzroy has many cafés. Only one of the original three cafés is still standing – Marios. Bakers relocated north, and closed in 2007, while The Black Cat has transformed itself into a bar, but still retains its onstreet garden. In fact Silas is the oldest café, located between King William and Moore Streets, on the west side. With the advance of gentrification, a variety of cafés in different styles have opened up and down Brunswick Street, on Smith Street, parts of Gertrude Street and in some of the back streets, in former milk bars and warehouse sites. Formed in 1883, the Fitzroy Football Club, an Australian rules football club, went on to play in the VFL/AFL. The club had some early success before relocating its home games several times and finally running into financial difficulties in the 1980s, forcing it to cede its AFL operations to Brisbane Bears at the end of 1996, upon which Brisbane changed their name to form the Brisbane Lions. Fitzroy came out of administration after the Brisbane merger in 1998, and the clubs shareholders voted for it to continue with the goal of resuming its playing operations. After sponsoring various local clubs, Fitzroy merged with the University Reds and finally returned the playing field after a 13-year absence, participating in the 2009 Victorian Amateur Football Association season with its home games played out of Brunswick Street Oval. Since that time, Fitzroy have doubled their membership and achieved promotion twice within the VAFA. The club currently plays in the premier B division and are the only football club to have played in the VFA, VFL, AFL, and VAFA competitions of Australian Rules football. Their home games are noted for their passion and community atmosphere, and in 2013 the club celebrated its 130th birthday. The Fitzroy Stars Football Club are an Indigenous club that joined the Northern Football League in 2008. They currently play their home games at Crispe Park in Reservoir with the club's off-field administration still based in Fitzroy. Fitzroy United Alexander Football Club, now Heidelberg United, was Fitzroy's first ever sporting club to play at a national level. Founded by Melbourne's inner eastern Greek community, the club was relocated to the Brunswick Street Oval in early 1971 but later departed by late 1978. Whilst the club was based in Fitzroy, the club was initially participating in the Victorian State League where it was crowned state champions in the 1975 season. With the club's on and off-field strength, Fitzroy was invited to be an inaugural participant of the National Soccer League, the former highest level of soccer in Australia, where the club became the suburb's first national sporting team. Although administration and club training was based at in Fitzroy, the club used various venues in Melbourne for its home matches. The suburb's first domestic first tier sporting match of any code was played at the Brunswick Street Oval on 2 May 1977, with Fitzroy United defeating Brisbane Lions 4-1 in front of over 4000 attendees. The club participated in the 1977 and 1978 seasons as 'Fitzroy' finishing third and fifth respectively. In late 1978, the club and its administration was relocated to Olympic Village Stadium in Heidelberg West prior to the 1979, with name being changed to Heidelberg United FC as a result of a better stadium deal and there being a larger Greek community in Heidelberg West than Fitzroy. Fitzroy City Serbia Soccer Club, a soccer club formed in 1953 by Serbian migrants, is based in Fitzroy. The club is currently playing in the Victorian State League Division 3 South-East and play their home games at Fairfield Park, with the club's off-field administration still based in Fitzroy. The Fitzroy Baseball Club, known as the Fitzroy Lions, is a baseball club founded in 1889 to represent Fitzroy. The club has five senior teams competing in the Baseball Victoria Summer League, as well as junior sides representing the club at every age level. The Melbourne Chess Club, the oldest chess club in the southern hemisphere (est. 1866). The heritage-listed "Aqua Profonda" sign made famous in Helen Garner's 1977 novel Monkey Grip. The 1977 cult classic novel Monkey Grip by Helen Garner took place mostly in Fitzroy and Carlton. Many of the central characters frequent the Fitzroy local swimming pool in the summer, referred to as the "Fitzroy baths", and the heritage-listed "Aqua Profonda" sign at the deep end of the pool is the title of the novel's first chapter, used as a metaphor for the central character's deeply troubled romantic relationship with a man. The inclusion of the sign and the pool itself gave it some degree of iconic status–its use in the novel was even mentioned in the statement of significance for the sign's heritage listing in 2004. The 2010 Australian television show Offspring was set almost entirely in Fitzroy. The main characters of the show were often seen at the Black Cat, a Brunswick Street bar. 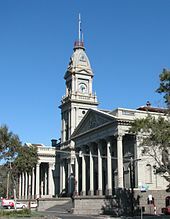 Fitzroy has also featured in episodes of a number of Australian TV shows, including City Homicide and Rush (notably in Season 3, where the team shot at Fitzroy Town Hall to commemorate the death of a former colleague). The movie series and television series, Jack Irish, is filmed in Fitzroy. Based on the Peter Temple novels, it features many Fitzroy cultural icons. Australian musicians have also made mention of Fitzroy in their lyrics. 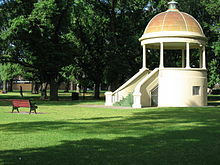 Clare Bowditch made a reference to Fitzroy in the song Divorcee by 23, as did the musical comedian The Bedroom Philosopher in the song Northcote (So Hungover). In his song "Slater", American rapper Tyler, The Creator mentions skating to Fitzroy. Most notably, ARIA award winner Dan Sultan has the song Old Fitzroy, the black and white video for which is shot entirely in Fitzroy, featuring shots of and from Atherton Gardens, as well as shots of a number of Fitzroy pubs. Brody Dalle sings about growing up in Fitzroy in The Distillers song "Young Crazed Peeling." The health needs of Fitzroy residents and other Melburnians is served by St Vincent's Hospital. There are two primary schools in Fitzroy: Fitzroy Primary School (government school) and Sacred Heart Primary School (Catholic school). Fitzroy High School is located in North Fitzroy. A long tradition of community activism and civil society with many social and community service organisations having been based in Fitzroy. Organisations currently operating in the suburb include; the Fitzroy Legal Service, Yarra Community Housing Limited, Society of Saint Vincent de Paul, Brotherhood of St Laurence and the Tenants Union of Victoria, a free legal service for residential tenants. Fitzroy's major road arterials are Brunswick Street (north-south) and Johnston Street (east-west). Other main roads include Victoria Parade, Nicholson Street, Smith Street and Alexandra Parade, which circumnavigate the suburb. It is characterised by a fairly tightly spaced rectangular grid of medium-sized streets, with many of its narrow streets and back lanes facilitating only one-way traffic. Traffic and parking congestion is a problem and Fitzroy and local councils have implemented strategies to keep this traffic off residential side streets. It has been the site of several controversial inner city freeway proposals, particularly in the 1950s, however none of which have proceeded. There are no railway stations located in Fitzroy itself, with the nearest train stations being Rushall in North Fitzroy and Collingwood and Parliament Stations. An underground railway line running between the City Loop and Clifton Hill, with stations located beneath Brunswick Street and Smith Street, has been proposed. Route 86 (Bundoora – Docklands): travels along Nicholson Street, Gertrude Street and Smith Street. Route 96 (East Brunswick – St Kilda): travels along Nicholson Street. Route 11 (West Preston – Victoria Harbour Docklands): bisects Fitzroy along Brunswick Street. 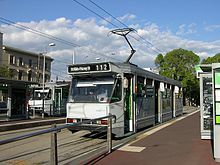 The St Vincents Plaza tram interchange, in adjacent East Melbourne, is at the junction of Victoria Parade and Brunswick Street and handles tram routes 24, 30, 86, 109 and 11. Cycling is a very popular form of transport in Fitzroy, as with much of the City of Yarra. A station for the Melbourne Bicycle Share scheme is located near the St Vincents Plaza tram interchange. The City of Yarra also supports a car sharing service, which has several locations in Fitzroy. Jack Cooper (1889–1917) – Australian rules footballer. Brody Dalle (1979–) – lead singer of The Distillers. Alfred Deakin (1856–1919) – second Prime Minister of Australia. Florrie Forde (1875–1940) – popular singer and entertainer. E. Phillips Fox (1865–1915) – painter, associated with the Heidelberg School. Neil Harvey (1928–) – Test cricketer, captained one Test. Merv Harvey (1918–1995) – Test cricketer. Ray Harvey (1926–) – first-class cricketer. Mick Harvey (1921–) – first-class cricketer and Test umpire. Donald Alaster Macdonald (1859–1932) – journalist, nature writer and sports commentator. Mary MacKillop (1842–1909) – Roman Catholic nun and the only Australian saint, born on Brunswick Street. Laurie Nash (1910–1986) – Test cricketer. Bert Newton (1938–) – television personality. Charles Nuttall (1872–1934) – painter, cartoonist and illustrator. ^ a b Australian Bureau of Statistics (27 June 2017). "Fitzroy (Vic.) (State Suburbs)". 2016 Census QuickStats. Retrieved 14 August 2017. ^ "Fitzroy, Victoria". 2 July 2004. Archived from the original on 2 July 2004. Retrieved 26 August 2018. ^ "Municipal Government". eMelbourne - The Encyclopedia of Melbourne Online. School of Historical Studies, Department of History, The University of Melbourne. Retrieved 30 April 2018. ^ DELWP (22 May 2017). "DELWP". DELWP. Retrieved 26 August 2018. ^ First, Jamie (7 January 2014). "The A–Z story of our suburbs". Herald Sun. Retrieved 27 October 2017. ^ "VICTORIAN HISTORY". The Argus. Melbourne: National Library of Australia. 15 October 1909. p. 9. Retrieved 26 September 2013. ^ Barnard, Jill (25 February 2010). "Collingwood". e-Melbourne. School of Historical Studies Department of History, The University of Melbourne. Retrieved 25 September 2013. ^ a b c d "FIRST HALF-YEARLY REPORT OF THE MUNICIPAL COUNCIL OF FITZROY, FROM 30TH SEPTEMBER, 1858, TO 31ST MARCH, 1859". Fitzroy City Press. Vic. : National Library of Australia. 20 July 1900. p. 3. Retrieved 25 September 2013. ^ Cooksley, Jean. "Langton, Edward (1828–1905)". Australian Dictionary of Biography, National Centre of Biography, Australian National University. Retrieved 25 September 2013. ^ R Proudley. Circle of Influence: A History of the Gas Industry in Victoria, Hargreen/Gas and Fuel Corporation of Victoria, Melbourne, 1987. p. 40-49. ^ "Fitzroy : Melbourne's first suburb / Cutten History Committee of the Fitzroy History Society. Published South Yarra, Vic. : Hyland House, 198 ISBN 0-947062-52-1"
^ "CREATING SLUMS". The Argus. Melbourne: National Library of Australia. 23 May 1923. p. 5. Retrieved 26 September 2013. ^ "Camp may be "for keeps"". The Argus. Melbourne: National Library of Australia. 10 January 1953. p. 5. Retrieved 26 September 2013. ^ "OUTCRY RAGES OVER THE FITZROY SLUMS". The Argus. Melbourne: National Library of Australia. 12 October 1955. p. 1. Retrieved 26 September 2013. ^ "Burt, Walter Oswald (Ossie) (1893–1969) Biographical Entry". Adb.online.anu.edu.au. Retrieved 27 July 2008. ^ theage.com.au: "There goes the neighbourhood?" ^ theage.com.au: "Fitzroy gets set for new development battle"
^ pandora.nla.gov.au: "'Urban Joke' campaign against 'Urban Jazz' "
^ "Fitzroy Town Hall". Victorian Heritage Database. Heritage Council of Victoria. Retrieved 14 October 2008. ^ Do That Dance! Australian Post Punk 1977–1983, abc.net.au. Retrieved 30 October 2010. ^ "Aqua Profonda sign, Fitzroy Swimming Pool". Victorian Heritage Database. Heritage Victoria. ^ "Cordial Factory". Victorian Heritage Database. Heritage Victoria. ^ "Former Exhibition High School Residence". Victorian Heritage Database. Heritage Victoria. ^ "Former National School". Victorian Heritage Database. Heritage Victoria. ^ "Dodgshun House". Victorian Heritage Database. Heritage Victoria. ^ "The Terrace". Victorian Heritage Database. Heritage Victoria. ^ "Shop & residence". Victorian Heritage Database. Heritage Victoria. ^ "Cathedral Hall". Victorian Heritage Database. Heritage Victoria. ^ "Melbourne Veterinary College". Victorian Heritage Database. Heritage Victoria. ^ "Royal Terrace". Victorian Heritage Database. Heritage Victoria. ^ "Shops". Victorian Heritage Database. Heritage Victoria. 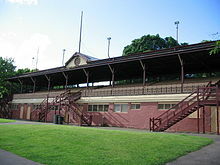 ^ "Fitzroy Cricket Club Grandstand". Victorian Heritage Database. Heritage Victoria. ^ "Devonshire Arms Hotel". Victorian Heritage Database. Heritage Victoria. ^ "Christian Israelite Sanctuary". Victorian Heritage Database. Heritage Victoria. ^ "St Mark's Church of England". Victorian Heritage Database. Heritage Victoria. ^ "Glass Terrace". Victorian Heritage Database. Heritage Victoria. ^ "Shops & Residence". Victorian Heritage Database. Heritage Victoria. ^ "Holyrood Terrace". Victorian Heritage Database. Heritage Victoria. ^ "Cobden Terrace". Victorian Heritage Database. Heritage Victoria. ^ "Residence". Victorian Heritage Database. Heritage Victoria. ^ "All Saints Church Hall". Victorian Heritage Database. Heritage Victoria. ^ "Falconer Terrace". Victorian Heritage Database. Heritage Victoria. ^ "Fitzroy Town Hall". Victorian Heritage Database. Heritage Victoria. ^ "Cable Tram Engine House". Victorian Heritage Database. Heritage Victoria. ^ "Osborne House". Victorian Heritage Database. Heritage Victoria. ^ "Mercy Convent". Victorian Heritage Database. Heritage Victoria. ^ "Cairo Flats". Victorian Heritage Database. Heritage Victoria. ^ "Denny house". Victorian Heritage Database. Heritage Victoria. ^ "Avon Butter Factory". Victorian Heritage Database. Heritage Victoria. ^ "Methodist Church". Victorian Heritage Database. Heritage Victoria. ^ "Post Office". Victorian Heritage Database. Heritage Victoria. ^ "Union Bank of Australia". Victorian Heritage Database. Heritage Victoria. ^ "Eastern Hill Hotel". Victorian Heritage Database. Heritage Victoria. ^ "McClelland house". Victorian Heritage Database. Heritage Victoria. ^ "Blanche Terrace". Victorian Heritage Database. Heritage Victoria. ^ Barrett, Damian (9 December 2008). "The old Lion roars again as Fitzroy is reborn". Herald Sun. ^ "Heidelberg United - Divisional History". Ozfootball.net. Retrieved 26 August 2018. ^ "1977 National Soccer League results". Ozfootball.net. Retrieved 26 August 2018. ^ Syson, Ian (5 July 2013). "Neos Osmos: Soccer at the Fitzroy Cricket Ground". Neososmos.blogspot.com.au. Retrieved 26 August 2018. ^ "Melbourne Chess Club". Melbournechessclub.org. Retrieved 26 August 2018. ^ Hatch, Patrick (2 January 2016). "Battle of the titans kicks off the Melbourne Chess Club's 150th year". The Age. Retrieved 26 August 2018. 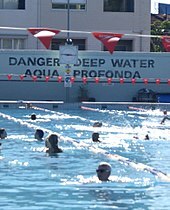 ^ ""Aqua Profonda" sign, Fitzroy Pool". Victorian Heritage Database. Retrieved 11 December 2017. ^ "au.news.yahoo.com". Au.news.yahoo.com. Archived from the original on 18 July 2011. Retrieved 26 August 2018. ^ Ten, Network. "tenplay". TenPlay - tenplay. Retrieved 26 August 2018. ^ "Murder at Savanah Design - Design in the mind". Savanahdesign.com.au. Retrieved 26 August 2018. ^ "Clare Bowditch and the Feeding Set - Divorcee by 23 Lyrics - SongMeanings". SongMeanings. Retrieved 26 August 2018. ^ "Northcote (So Hungover) lyrics. - The Bedroom Philosopher". Bedroomphilosopher.com. Retrieved 26 August 2018. ^ "Tyler, The Creator (Ft. Frank Ocean) – Slater". Genius.com. Retrieved 26 August 2018. ^ Metropolitan Groove Merchants (30 August 2010). "Dan Sultan - Old Fitzroy". YouTube. Retrieved 26 August 2018. ^ White, Anthony D. (1983). "Horsfall, Alfred Herbert (1871-1944)". Australian Dictionary of Biography. Australian National University. Retrieved 30 March 2015. Wikimedia Commons has media related to Fitzroy, Victoria. "Fitzroy" . Encyclopædia Britannica (11th ed.). 1911.